Sid Adams and Callum Ward are both due to trial with Harlequins next week to be part of the academy system, unfortunately Daniel Peterson (Captain) has picked up a shoulder injury which will stop him from trialling. They have now had a bye through to the 2nd round in the Surrey Cup. 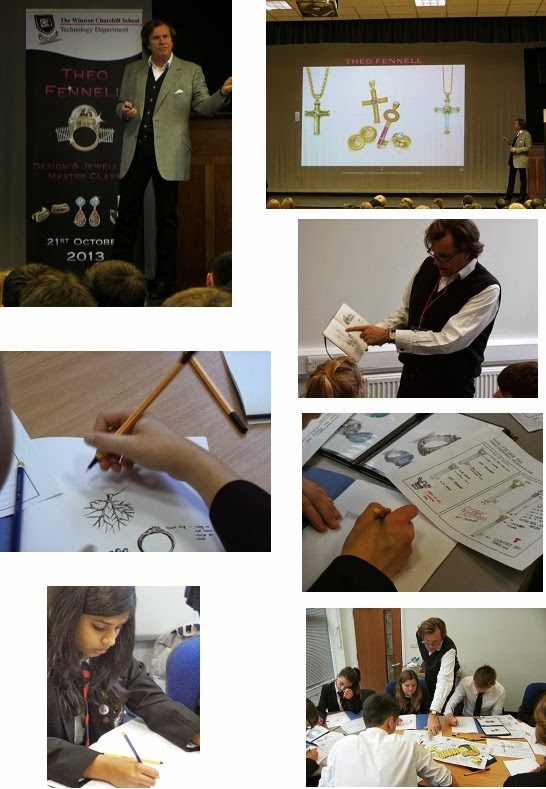 On the 21st October 2013 Winston Churchill School’s creative GCSE Resistant Materials, Graphics and Gifted and Talented Technology students from year 8 and 9 were welcomed to a glittering master class in design with world acclaimed designer Theo Fennell. Theo first gave a captivating presentation to 150 of our students sharing his knowledge of the design industry, how he gets inspired to design his beautiful pieces as well as the skills you need to succeed in the creative industries and a few stories about his celebrity clients. Then 30 lucky students were selected after submitting their own designs inspired by Theo’s work to have a smaller master class where Theo showed them his sketch books and how the design process is implemented. The experience does not stop there on the day Theo was so impressed with 9 students that he has offered them the amazing opportunity to visit his workshop and flagship store in February. Two of these students will then be given work experience with him at the end of the summer term. For a long time we had never really expressed any interest in jewellery or its design and it was something that had never notably entered our thoughts, as a pair of Graphics & Resistant Materials students, prior to being given the opportunity to enter a competition for the opportunity to join a master class with “Theo Fennell” (the acclaimed jeweller) which totally morphed our perception- or rather a lack of a perception - for the art of Jewellery into a small obsession. We began to view some of his work and it struck us the: attention to detail; care for material and art; relentless passion and strive for perfection which was evident in his work. Triggered by this, We and many other students began to form a few sketches trying as best we could to emulate some of Fennell’s rare theatrically bold and magical styles. We were very fortunate to be able to be part of this master class as a result of the sketches we had drawn up and we also had the opportunity to listen to a speech he was giving to gifted and talented and Technology students. Per contra to the possibility inspiring may be a rather prevailing term, We do find the presentation was truly inspiring and we were animated. In his talk on the 21st Fennell said that to him “the fact that you dig a person up 200 or even 2,000 years later and they are still wearing a piece of jewellery shows that it is a very permanent thing” he also emphasised the importance of the art behind designing such striking work which really gave us the opportunity to see a section of design we had previously been almost oblivious to. The workshop was very helpful in developing and approaching our designs from a different angle; Fennell helped encourage and motivated the group in that respect. It was an honour to have him help us with our work and we feel we all learnt a great deal from the workshop. We have also been given an opportunity to visit, along with another 8 students, his workshop and flagship store on Fulham Road in Knightsbridge and we think it is fair to say we are all exited. It will be a great opportunity to see how such exquisite jewellery is designed, made and crafted in such a well renowned and unique jewellers. It will be giving us a glimpse of the rarity to craft such jewellery on the premises and into the world of Theo Fennell. It has been a different and exciting experience; we have been inspired and encouraged and our personal awareness, knowledge and attitude for this form of design have been enhanced a great deal. The group and everyone at the talk on Monday were very grateful and appreciated Theo Fennell’s great work and thanked him for taking the time out from his busy schedule to come and visit the school. Rachel Muir (Year Rep for current Year 9) presented a cheque for £3,006.35 to Mrs Wendy Denty in aid of the year groups nominated charity, Woking Hospice. The year group were generously supported by friends & families in their fundraising efforts which say the students organise all manner of activities from bake sales & car washes to an obstacle course & a "River Run" challenge in which students covered in excess of 2000km exercising in the gym. 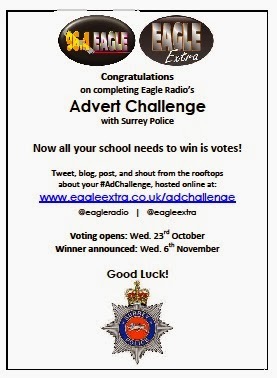 24 Winston Year 11 students took part in the Surrey Police Eagle Radio Advert Challenge. They created adverts for prevention of antisocial behaviour during bonfire night and halloween and then recorded them using the School's radio station. Former Winston student Sam Underwood is continuing his successful acting career with a part in the smash-hit television series Homeland. Open Evening - A Great Success! The School Open Evening which which took place on Thursday 3rd October was a great success with the staff and students demonstrating to parents and Year 6 pupils just what Winston is all about, high standards and enthusiasm in everything we do. The students were able to show off their school with pride and were confident in their roles as tour guides. If you were unable to attend our Open Evening or would like to visit the school during our working day please book a place on one of our tours by following the link on the Home Page of our website.